From the Kent ports take the M2 / A2 towards London. Exit at the A2 /M25 junction. Follow signs at this junction towards Dartford A225. Take the first exit off the roundabout towards Dartford, then first exit at the second roundabout – the B260 Green Street Green Road. At the second roundabout turn right over Darenth Hill, Fresh Service is on the left hand side at the bottom of the hill. From the M20, take the last exit and turn north onto the M25 towards Darftord. At junction 2 follow the instructions as above. Please note that the best route for heavy goods vehicles is from the A2/M25 interchange, rather than Junction 3 of the M25 via the A225. If using the M20, please take the M25 North to junction 2 or take the A229 onto the M2 at Bluebell Hill near Maidstone. 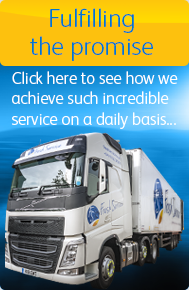 Full address: Fruit Distribution Depot, Darenth Hill, Near Dartford, Kent, DA2 7QY. Our Dartford site is at 51.4188 N Latitude and 0.2433 E Longitude. From the M20 leave at junction 4 and take left hand turn off towards Kings Hill and Paddock Wood – A228. Take the first exit at the first roundabout towards Paddock Wood – A228 Seven Mile Lane. Proceed on the A228 Boyle Way towards Paddock Wood at the first roundabout. At the Hop Farm roundabout take the first exit B2160 Maidstone Road. Transfesa Road is on the left hand side about 1 mile from the roundabout. Full address: Transfesa Road, Paddock Wood, Kent, TN12 6DG. Our Paddock Wood site is at 51.1854 N Latitude and 0.3880 E Longitude.